Apple may be able to finally stop relying on iPhone processors from rival smartphone maker Samsung in 2014, according to a report out of Taiwan today. Instead, the company is expected to contract Taiwanese manufacturer Taiwan Semiconductor Manufacturing Company for all application processors used in 2014 models of its phone, wrote DigiTimes citing industry sources. TSMC is said to be preparing new equipment at its southern Taiwan facilities in anticipation for next year's iPhone demand. 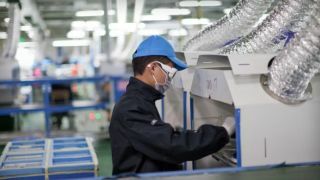 By the end of this year, the manufacturer will have an advanced semiconductor fabrication facility, moving it from 12-inch silicon wafers to 14-inch wafers, according to the report. TSMC's acceleration of its new fab 14 facility is being seen as a sign that Apple wants to move from Samsung to the Taiwanese manufacturer as soon as possible. We've reviewed the iPhone 6 and iPhone 6 Plus! Samsung is still expected to manufacture the next iPhone chips, rumored to be the Apple A7, this fall, despite TSMC's hastened roll out of new equipment. Whether or not this last Samsung-produced system-on-a-chip is in an iPhone 5S or iPhone 6 depends on what Apple announces this fall. Beyond that, TSMC should be able to take over by the 2014 iPhone launch, as the company will be ready in the second half of the new year, according to the report. Apple's move away from Samsung wouldn't be a big surprise considering the South Korean company is its chief competitor with Android-based smartphones like the Galaxy S4. And then there's that whole billion-dollar patent lawsuit between Apple and Samsung. The news, if true, might be an even bigger blow to Intel, which was rumored to be inheriting the iPhone system-on-a-chip-making business from Samsung. Intel and Samsung, the world's first and second largest semiconductor companies, would all of a sudden have to compete against current No. 3, TSMC.